Nevada's Dean Heller Embraces Trump In Tough Re-Election Battle Heller is considered the most vulnerable Republican in the 2018 midterms. He's defending his vote on the GOP health care bill and touting a close relationship with the president. President Trump arrives with Sen. Dean Heller in Nevada on Saturday for a campaign rally. Nevada Sen. Dean Heller turned to President Trump at a rally Saturday and told him, "everything you touch turns to gold." Whether or not Heller returns to the Senate next year may be the ultimate test of that statement — at least when it comes to politics. 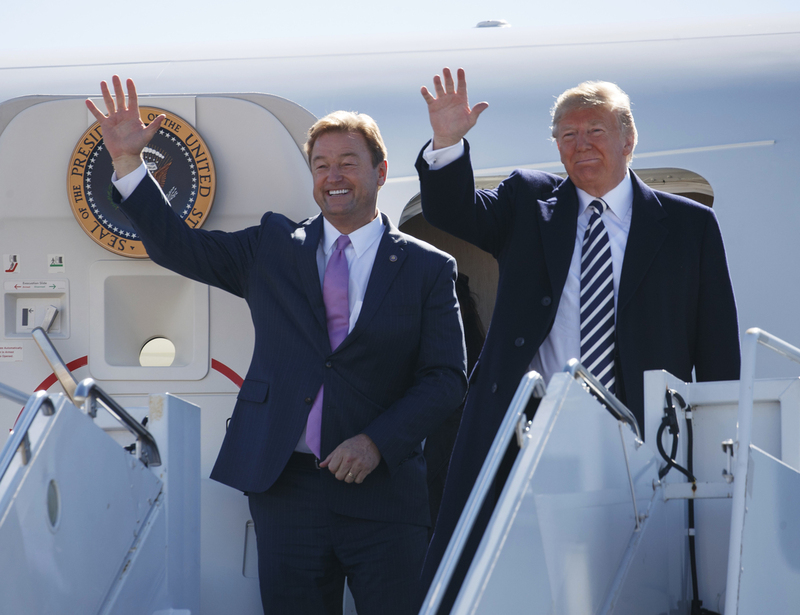 Few Republicans have traveled further than Heller from entrenched Trump critic to staunch Trump ally. Two years after memorably saying he was "99 percent against" Trump, Heller is not only repeatedly appearing with Trump at political rallies, he's using his speaking slots at the events to heap compliment after compliment on the president. "We weren't friends. I didn't like him, he didn't like me." Trump recently told a Nevada crowd. The president memorably taunted Heller during a White House meeting at a point when Heller was a key holdout on the Republican effort to repeal the Affordable Care Act. But then, Trump recalled, "We started to like each other, then we started to love each other." A close relationship with Trump is an asset in 2018, if a Republican wants to survive a primary challenge. But it's not clear how that positioning plays in a general election in an evenly-divided state like Nevada. Whether or not voters reward or punish Heller for his evolution to close Trump ally will be one of several key political questions that Nevada's Senate results will answer. The outcome will also show whether Democrats or Republicans ended up more energized this year, and how Democrats navigated the challenging terrain of the 2018 Senate map. Nevada will likely be the most closely-watched Senate race over the final two weeks of the midterm campaign season. Early voting plays a critical role in Nevada elections, with more than half of the state's voters casting ballots before Election Day. County election boards provide daily updates on how many voters from each party have cast ballots, and both Democrats and Republicans are working hard to get as many people to the polls before November 6 as possible. After three full days of voting, it's not quite clear which party has the upper hand. Nevada's most prominent political journalist, Jon Ralston, wrote Tuesday morning that "it does not appear yet to be a wave election, as it was in 2014 (red) and 2016 (blue). But this is not like the last two midterms. ...It looks now like an unusually high turnout year for a midterm, three quarters of the last presidential year." Typically, the higher the turnout the better it is for Democrats in Nevada, but Ralston cautioned against drawing too many conclusions until several more days' worth of early voting data had come in. In the meantime, Democrats are doing everything they can to energize the type of voter who shows up in presidential races but sits midterms out. Former President Barack Obama rallied with Rep. Jacky Rosen, Heller's Democratic challenger, in Las Vegas Monday, warning that, "the consequences of you staying home would be profoundly dangerous to this country, to our democracy." 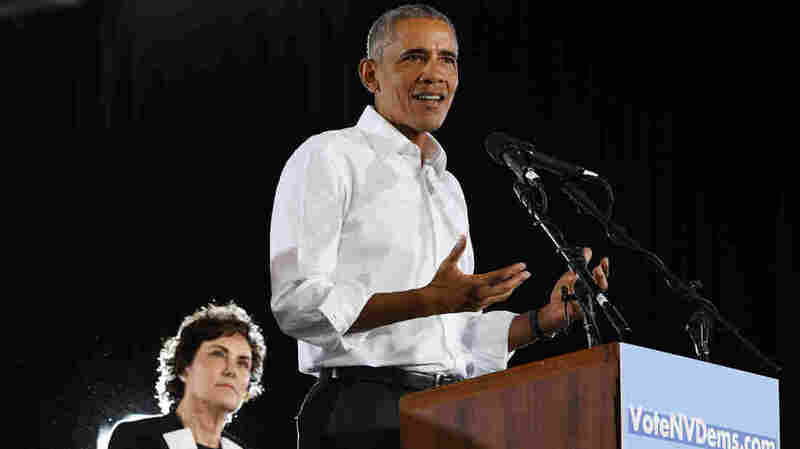 Rep. Jacky Rosen, D-Nevada, looks on as former President Barack Obama speaks during a get-out-the-vote rally as he campaigns for Nevada Democratic candidates on Monday in Las Vegas. Former Vice President Joe Biden recently visited the state, as well, as have several likely 2020 Democratic candidates. For her part, Rosen is trying to channel anti-Trump energy into votes. While many other Democratic candidates have tried to keep Trump out of their campaign messaging, Rosen is framing a vote for her as a vote to put a check on the Trump administration. She's repeatedly criticized Trump's decision to try to end the Deferred Action for Childhood Arrivals Program, known as DACA, as well as his controversial policy of separating children from parents who tried to enter to the United States illegally at the southern border. And Heller's swing from "no" to "yes" during last year's Obamacare repeal attempt is a centerpiece of Rosen's ad campaign. Rosen told NPR that the repeal attempt has stuck with voters for a simple reason: everyone gets sick. "That's the thing that binds every single person," she said, "even though there may be other things they're worried about. That's why it matters." Rosen has called Heller a "blank check" for Trump, and her campaign has portrayed him as one of those wiggling tube men often spotted in front of car dealerships, drifting in the wind between anti-Trump and pro-Trump positions. At the end of their lone televised debate last week, Heller defended his newfound faith in President Trump. "We started working together and it built trust," he said. "When you have success it builds trust. When you have trust it builds friendships."